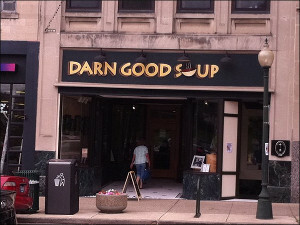 Darn Good Soup's reason for existence is to provide delicious, healthy food – FAST. We have 8 to 10 fresh soups daily, including vegetarian and vegan options, each served with bread. We also have salads available. We serve you at the counter to eat in our casual dining area, or for carry-out.